What did Sharif tell Modi? Why do both sides desire a dialogue? The Narendra Modi government is under attack for taking a U-turn on Pakistan from those familiar with the trajectory of India-Pakistan relations. They predict that we will soon witness the tragedies of the past once again when the euphoria about restarting an India-Pakistan dialogue dissipates. After Ufa, there was speculation that the Modi government was keen on rewriting the rules of engagement with Pakistan. However, the Paris encounter between the two prime ministers, lasting less than three minutes, seems to have changed everything. It was followed with alacrity by an almost secretive meeting of the National Security Advisors and the Foreign Secretaries of the two countries in Bangkok. Two days after the Bangkok meeting, External Affairs Minister Sushma Swaraj flew to Islamabad for a multilateral conference on Afghanistan. After shaking hands with top Pakistani leadership she announced the resumption of a comprehensive dialogue between India and Pakistan with no hint of how this about-turn had taken place. The details of the Nawaz Sharif-Modi meeting in Paris have, however, now started trickling out. It seems that only after the Pakistan Prime Minister assured Modi in Paris that the Pakistan Army was keen to improve ties and was willing to curb terrorism against India that a thaw began in India-Pakistan ties. The initiative to meet in Paris on the sidelines of the Climate Summit apparently came from Sharif and not from the Indian side. 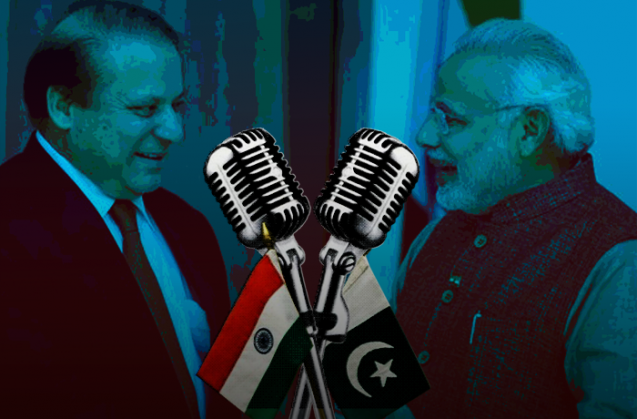 In the 167-second meeting, if sources close to the government are to be believed, Sharif conveyed to Modi that the Pakistan was inclined to move forward with India and wanted the dialogue restarted. He is also said to have assured Modi that even the Pakistan Army was on board on this matter. The Pakistan Prime Minister apparently told Modi that the current Pakistan Army Chief General Raheel Sharif was quite unlike his predecessor, General Ashfaq Parvez Kayani, who was known for his hardline attitude towards India. The current Pakistan Army Chief, Modi was told, was extremely worried about terrorists of all hues and had been acting against them. Such action, Sharif assured Modi, would target even groups like Lashkar-e-Tayyeba which indulged in terrorism against India. Modi was told that India would start seeing the results once the bilateral dialogue process was on track. After this assurance by the Pakistan Prime Minister, according to sources, Modi cleared the meeting between National Security Adviser Ajit Doval and his Pakistan counterpart Lt. General (Retd.) Nasser Khan Janjua which took place in Bangkok on December 6. Modi's brief to his NSA apparently was to "read the riot act to Pakistan". Apparently, Doval was extremely blunt in conveying the Prime Minister's message to the Pakistani delegation. According to sources, he is believed to have told Gen. Janjua that if Pakistan did not stop terrorism against India, it would continue facing internal instability. "How blunt the NSA really was, only he would know," said a source but added that Doval had reported back that, to his surprise, the Pakistani side was not in its usual combative mode and was willing to listen. Over the 4 hour long discussion, the Indian side is believed to have received the assurance that no one in Pakistan's establishment would provide direct or indirect support to terrorist activities in Jammu and Kashmir or any other part of India. Indian negotiators felt that while this was a good start, it could very well be tactical positioning by Pakistan given its international isolation over terrorism. Even before Tafsheen Malik, a Pakistani-origin woman, who along with her husband went on a rampage in St. Bernardino, California, shooting 14 people and injuring 21, Pakistan was being told even by the Muslim countries that globally it was being seen as the source of Islamic terrorism. They advised Pakistan to act to change that image. To negate that image also, it had become necessary for Islamabad to make an overture to India. However, the Indian negotiators came back from Bangkok with the distinct impression that they had been able to secure primacy for India's concern on terrorism. They saw the validation of this assumption in the joint statement issued after External Affairs Minister (EAM) Sushma Swaraj's visit to Islamabad where she met Prime Minister Nawaz Sharif and his Foreign Policy Adviser Sartaj Aziz. The second paragraph of the Joint Statement, thus, noted: "The EAM and the Adviser condemned terrorism and resolved to cooperate to eliminate it. They noted the successful talks on terrorism and security related issues in Bangkok by the two NSAs and decided that the NSAs will continue to address all issues connected to terrorism. The Indian side was assured of the steps being taken to expedite the early conclusion of the Mumbai trial." The statement then goes on list the subjects of the comprehensive dialogue where discussion on "counter-terrorism" is listed as a separate dialogue subject. This is now being tom-tommed as exactly what India wanted - a separate dialogue with Pakistan on terrorism. There were also compelling reasons for Modi not to spurn Nawaz Sharif's Paris overture. Apparently, during his frequent forays abroad, he realised that India had lost diplomatic ground internationally because of his refusal to talk to Pakistan. Except on the issue of terrorism, he saw that Pakistan's position had in fact improved - its economy was better than before, aid had started flowing in from the US and China, the relationship with China itself had become very strong and both US and China had put Pakistan in a pivotal role in stabilising Afghanistan. At the same time, Modi was projected in Pakistan as someone who could worsen the situation in the subcontinent. Pakistan had also used the precarious state of relations with India to justify the development of tactical nuclear weapons or smaller, low-yield, battlefield and easy to transport weapons like bombs and missiles. Pakistan claimed that the development of these battlefield nuclear weapons was necessary to counter India's "cold-start" war doctrine... It was important for India to deny the justification to Pakistan for escalating the nuclear race. However, despite the announcement of a comprehensive dialogue, no one in India foresees any big changes immediately. It is quite possible that the easier to address subjects like "religious tourism" would be taken up for discussion first before moving on to the more tricky issues. There is also apprehension about problems that could crop up once the dialogue is held either in Islamabad and New Delhi rather than in a third country. At that point several factors that have marred the dialogue process in the past, such as Pakistan insisting on talking to the All Party Hurriyat Conference before any engagement, could come up again. Talking with the Hurriyat is important for Pakistan because of its preoccupation in Jammu and Kashmir with the right to self-determination, rejecting elections and projecting the separatists as the real leaders of the Kashmiri people. It is also not going to be easy to talk about terrorism -- with Pakistan's claim that it is the bigger victim of terror, that it does not control terrorists and questioning India on the Samjhauta Express blasts by Hindutva terrorists. Despite these apprehensions, the Modi government has, however, decided to go ahead with the talks. "We will see where this takes us. But India is not going to have talks for the sake of talks," warned a source close to the negotiators. National Herald case: where did the Gandhis go wrong?